The Lapband procedure conducted by a skilled surgeon where an adjustable ‘restrictive band’ is placed around the top of the stomach. This adjustable gastric band’ works by reducing the amount of food that can be eaten in a sitting & by helping you feel ‘full’ more quickly. Ultimately, you feel more satisfied more quickly & the urge to overeat is removed. 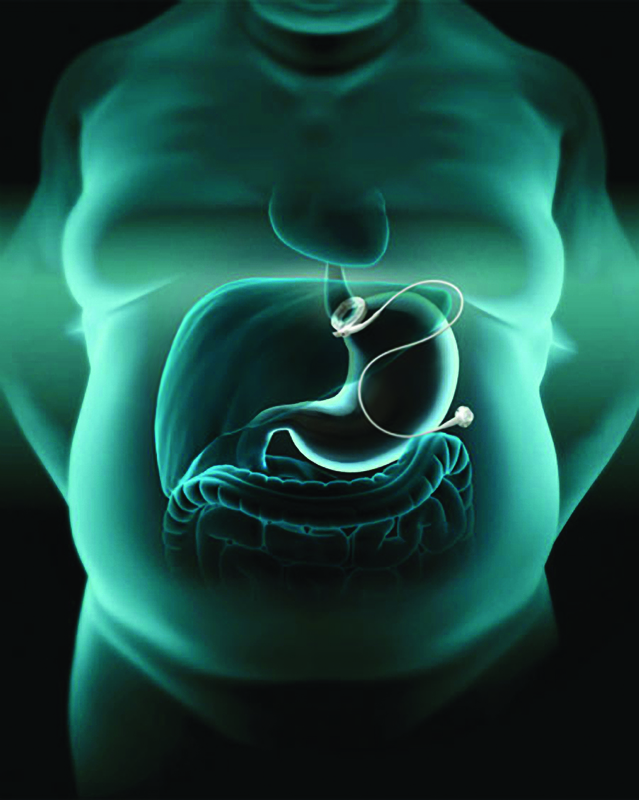 The Lapband System is a clinically proven medical device to aid with long-term weightloss. Studies have shown an average excess weight loss of 47.1% maintained at 15 years, with either complete control or improvement in obesity related diseases such as type 2 diabetes, sleep apnoea, heart disease, asthma and hypertension, among others. Patients can expect some Medicare refunds. Attached to the Lapband is an access port. The access port sits beneath the skin on the abdomen and allows the Lapband to be adjusted to the patients’ individual needs. For optimal weightloss, we work with you on a regular basis to ensure you are in the ‘Green Zone’. These adjustments do not require any additional surgery, are done in our clinic, and usually takes only a few minutes. Patients generally lose around 0.5-1kg on a weekly basis depending on their metabolism and eating & exercise habits, while a recent large Australian study from CORE, the Centre for Obesity Research & Education of Monash University, showed that patients maintained an excess weightloss of 47.1% long-term at 15 years. There is currently no wait time for Lapband surgery for patients who are wanting their procedure done as soon as possible. Patient’s will only need to allow enough time to commence their mandatory pre-surgery diet, this is usually 2 weeks duration and varies according to BMI. Of the current procedures offered worldwide, the Lapband System is the safest procedure due to it being a minimally invasive procedure, as it doesn’t require any removal or re-routing of the stomach or anatomy. The Lapband is intended to be implanted as a long-term device, however, if required it can be removed at any time. Who qualifies for the Lapband? Patients with a BMI of 35, or 30 with 1 or more obesity-related diseases, qualify for the procedure, which usually indicates around 20kg or more to lose. Dr Reza Adib does perform the Lapband on insured and uninsured patients. The Lapband System is a prosthetic device made from medical grade silicone which is used in many other medical devices such as hip prosthesis components. The procedure is usually performed as a one night stay in hospital, and recovery time is around 1-2 weeks. At Brisbane Obesity Clinic, your long-term health and weightloss goals are our priority; and following your LAPBAND procedure, your follow-up with us is key to success. Patients who have a Lapband will require ongoing band adjustments to keep the band tight. The surgeon will advise the patient of how regular the adjustments need to be made as they vary from patient to patient. Patients will receive a 12-month Dietitian program post operation. Are there any risks with the Lapband? As with any surgical procedure, there are risks however most patients are in hospital for one or two nights & are well recovered by the end of week one. Depending on the other illnesses you may have at the time of surgery, anaesthetic risks can vary, so particular attention is paid to the pre-operative assessment & during the surgical period to ensure that any potential complications are minimised. If you suffer from sleep apnoea or have breathing difficulties of any sort you may be asked to undergo a sleep study prior to surgery & have a special treatment regime established. Dixon JB, Schachter LM, O’Brien PE. Sleep disturbance and obesity: changes following surgically induced weight loss. Arch Intern Med. 2001;161:102-106. Dixon JB, Chapman L, O’Brien PE. Marked improvement in asthma after Lap-Band surgery for morbid obesity. Obes Surg. 1999;9:385-389. Dixon JB, O’Brien PE. 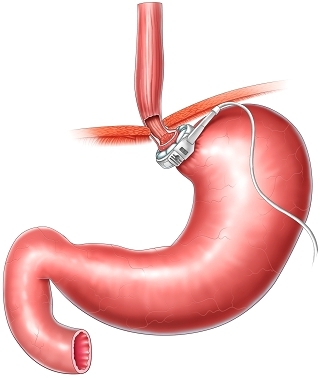 Gastroesophageal reflux in obesity: the effect of LAP-BAND placement. Obes Surg. 1999;9:527-531 .